Thu., Oct. 26, 2017, 5:55 a.m. 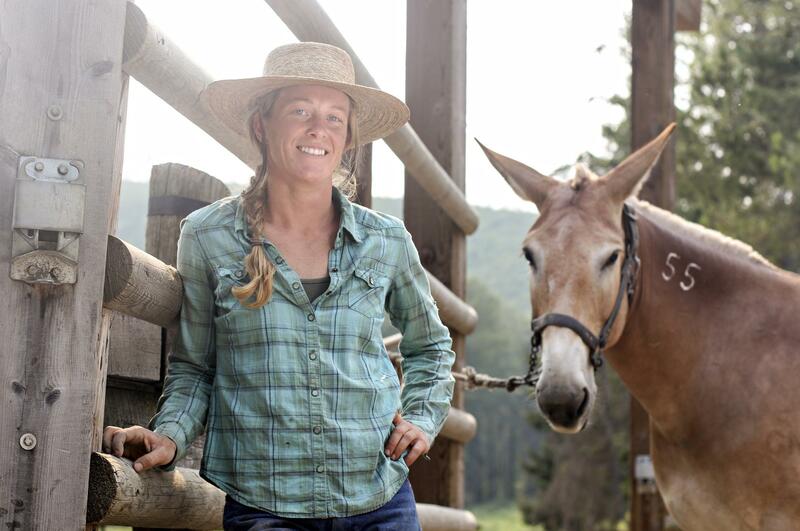 Packing is an ancient art and trade rooted in tradition, and while Jill Michalak subscribes to its customs with the utmost deference, she’s bucking convention at Glacier National Park, where this season she landed a job as the first female packer in the program’s century-old history. In places where wide expanses of wilderness have been set aside, the primitive skills that a good mule packer offers are invaluable, a sentiment that rings especially true in Glacier National Park, where 95 percent of its more than one million acres are managed as wilderness, flanked by the trappings of a mechanized world. “In a lot of ways, the mules preserve the park and keep it going in the direction it’s meant to go,” Michalak said recently on a smoky afternoon at the park’s pack barn near West Glacier, a mule-dominated museum of packing history. Although Glacier National Park lands are not federally designated wilderness, they are managed as wilderness per National Park Service policy, meaning the park must employ the least invasive, non-mechanized methods possible when any kind of human management is deemed essential at all. That means using handsaws to clear deadfall from trails, block-and-tackle pulley rigs to lift bridge timbers and spud bars to pry rocks out of trail treads. Mules are perfect for hauling such heavy gear in and out of the park’s vast backcountry. And while Michalak happens to be Glacier’s first female packer, the park is just the most recent stint in a dizzying packing resume that crisscrosses the world. Born in the cityscape of Los Angeles, Michalak began riding horses at age 5, after her father, a military man, moved the family to the U.S. Army post in Fort Rucker, Alabama. She learned to pack working for an outfitter in Alaska, and put herself through college at the University of Alaska Fairbanks while packing across the western United States, working for outfitters spanning the High Sierras to Mount Whitney, tracking along the Pacific Crest Trail on week-long trips and opening a portal that revealed packing opportunities across the globe. While packing on the Hoh River Trail in Olympic National Park, for example, Michalak met an ex-U.S. Army Special Forces operative named Dave Eubank. When Michalak’s mules bolted and broke loose, Eubank helped the young packer wrangle them back in line. Impressed with her savvy, Eubank invited Michalak to come work for his volunteer services organization in Myanmar (formerly Burma). Known as the Free Burma Rangers, the aid group relies on pack strings to deliver medicine, supplies and humanitarian support in regions where other aid organizations cannot go. In Mongolia, she worked as a packer with Cossack golden eagle hunters, and in Australia she packed in the Snowy Mountains, the highest mountain range on the mainland continent. While working as a packer in Olympic National Park, Michalak learned about the legacy of Minnie Peterson, the famed packer who pioneered trails throughout the high Olympic wilderness, living off the land and working for over 50 years as a guide, once leading President John F. Kennedy on a trip for the Sierra Club. “There are so many women who have left their mark on packing,” Michalak said. In Glacier, a wild chunk of pristine country that remains one of the largest intact ecosystems in the lower 48 states, Michalak said the importance of maintaining the park’s natural integrity is impressed upon almost anyone who visits, but especially the packers. Glacier’s fleet of mules includes 44 majestic creatures ranging in age from 7 years old to 27 years old, which Michalak describes as “1,500-pound children,” each with its own name. “Not only do they all have names, but they all have very distinct personalities,” Michalak said. Calling the six mules that are her charge “the sexiest string in the park,” Michalak knows precisely which personality fits best in the order of the pack string, like Santa and his reindeer. First comes Brady, the lead mule who every morning waits at the pasture gate ready and eager for work. Next there’s Rance, “a big goof who’s always looking for a bite to eat,” and then Debbie, Mike and Kate. Finally, bringing up the rear is Tate, a cranky mule who’s apt to stop walking whenever the mood strikes him. On any given day, Michalak loads her pack string with wooden planks, fuel tanks, saws, pulaskis, canvas sheets, rope, and other tools. She bundles her cargo in heavy canvas tarps called manties, swatches of which generally measure about 7 feet by 8 feet wide. Wrapped like a package, the bundle is tied with manty rope and lashed to each side of a Decker-style packsaddle. The Glacier pack crew adheres to Decker-style packing, which came into vogue in the western United States in the early 20th century and continues to reign supreme for packing purists. Elwood said Michalak possesses the mettle of a packing pro – she regards the trade’s traditional roots with deep esteem, she possesses all of the skills and knows how to use them, and she understands the importance of maintaining public lands and wilderness. Published: Oct. 26, 2017, 5:55 a.m.